Benne Hole Falls is one of the most spectacular waterfalls in North Karnataka. North Karnataka is said to have a number of waterfalls and one such picturesque waterfall is Benne Hole waterfalls. The name Benne Hole is because of the white creamy look of the waterfall. In Kannada, Benne is butter and hole refer to big stream, hence the name. The waterfall is formed by the tributary of the river Aghanashini, which flows through the dense forests of the Devimane Ghats region in the Western Ghats. The waterfall falls from a height of 200ft forming an alluring treat to one’s eye. Benne Hole Falls is known for trekking and the 2km trek to the top of falls is both arduous and a herculean task. One has to be adept and know the intricacies of trekking to reach the top. The view from the top of the falls is breathtaking and worth the hardships faced during the trek. Along with trekking, the tourist also can look out for some exotic birds. Some of the exotic birds found in Benne Hole waterfall area are grey jungle fowl, wooly necked stork, jungle owlet, coppersmith barbet, orange minivet, black headed oriole, common kestrel and plum-headed parakeet. This area attracts a lot of tourists and due to this reason the tourism department of Karnataka have recognized its potential and have developed it better for trekking. This attracts more tourists as well as adventure seekers. 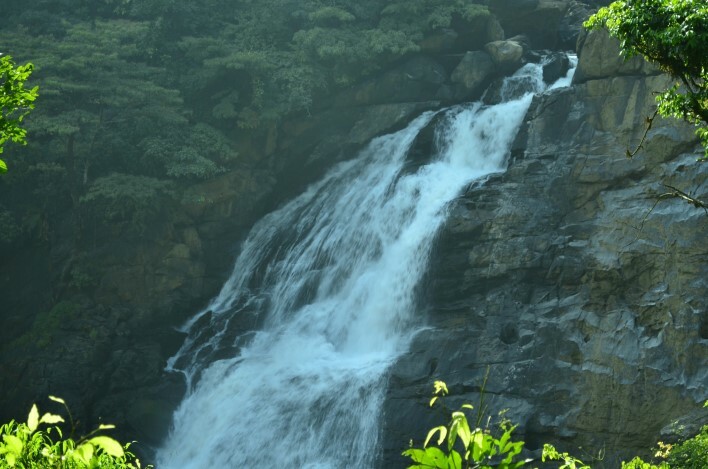 The waterfall is located at about 26 kms from Sirsi. One has to first reach a village called Kasage, which is about 21 kms from Sirsi and from there the falls are about 5 kms away. The first 3 kms can be covered by jeep and next 2 kms by walk. Sirsi is the nearest town to the falls. Sirsi is well connected with major cities and towns of Karnataka by bus service. A number of private and tourist buses run regularly from neighboring cities to Sirsi. A direct drive to Sirsi through NH 48 route from Bangalore (400 km) and Mysore (470 km) is the other option out of the lot. The nearest railway station is located at Sirsi which is about 26km from the falls. There are many buses and autos which connect Sirsi and Kasage. Nearest airport to the falls is Hubli Airport. One can opt for Bus service from the airport to Sirsi.